Remsen’s 43rd Annual OKTOBERFEST This Weekend! Come to Remsen and help us celebrate! This entry was posted in Events, Featured, News on 10/28/2016 by Courtney. The City of Remsen recently received a Certificate of Equality for achieving gender equality on all key appointed boards and commissions. Remsen is one of 31 cities in the State of Iowa (out of 209 surveyed) that have established equality. 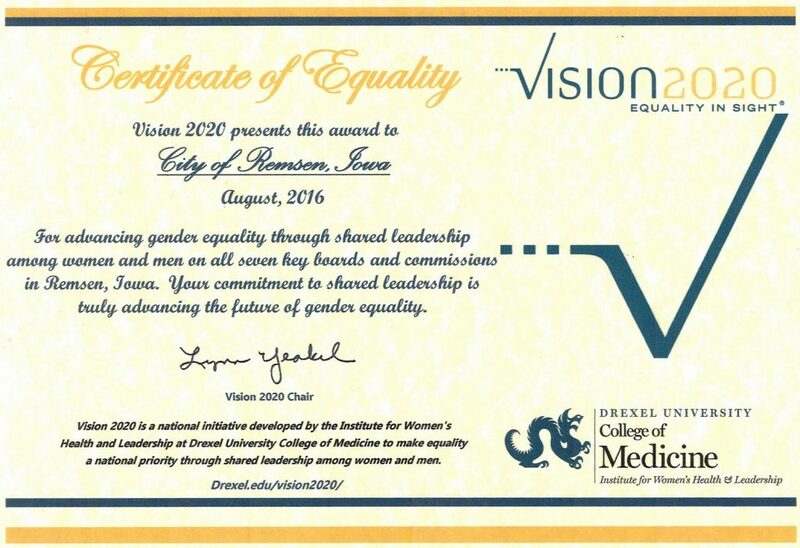 Vision 2020 is a national initiative developed by the Institute for Women’s Health and Leadership at Drexel University College of Medicine to make equality a national priority through shared leadership among women and men. 2020 is a significant year as it will mark the 100th Anniversary of women having the right to vote. This entry was posted in Featured, News on 10/28/2016 by Courtney.